Photo courtesy of Jessica Koker. Menu found in Kyoto, Japan. I’ll take an order of spite with a side of scorn please. Funny…in my travels I’ve run across FAR more morning scorns in Beijing than I did in Kyoto or even Tokyo. You know it’s not going to be a good day when it starts with Scorn! Wasn’t that our waitress wearing that – umm – questionable sweater yesterday ? For her, scorn is an improvement ! And for dinner we can have scornbread. Makes you wonder what you get if you ask for a biscuit ? In that case they’ll be happy to dish up afternoon tea with scorn also. A favorite of ex-wives everywhere! Hell hath no fury as a breakfast scorned! I don’t need you anymore, breakfast! I have my eye on that brunch! The tea is good, but these scorns taste a little bitter. You call that scorn. You want to try asking my wife for a cuddle in the morning. What no jam and cream!! 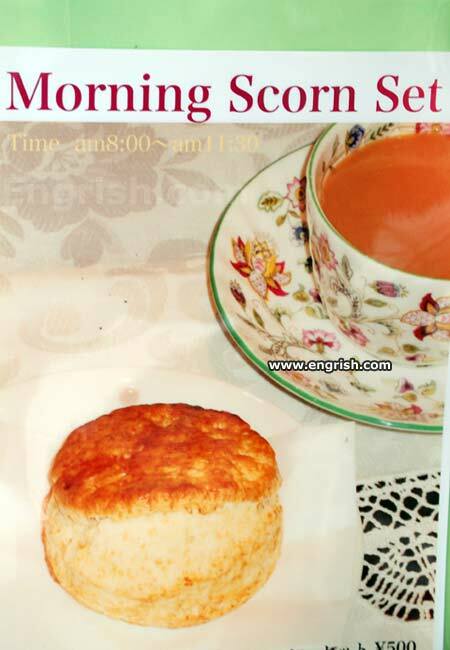 If I wanted scorn in the morning, I’d get married. The lunch special for today is Knuckle Sandwiches. There’s nothing in the world like a biscuit scorned. When you get married, you get scorn morning, noon, and night. And on both special occasions and no special occasion. KinkyTom, just remember don’t heat it up, because it’s best served cold. Could someone just pass me the damn coffee? So who else got up on the wrong side of the bed? Good morning honey. I loathe you. …an integral part of a complete punishment! A great way to start a terrible day. Can I get a side of spite with that? And eat Scorns butter rith Tea. is scornful humility in your cup! There’s a matching set for evening fury.